Experience pleasurable dining moments in this wonderful Caribbean Island mostly with their live music serving local and international cuisine. Treat the whole family to a delightful and festive dining, or your friends for fun and entertainment at Cancun's nightclubs. Check out the variety of gourmets on the list. Mexico's diverse and rich culture makes shopping a favorite activity among tourists and locals alike. Shopping experience in Cancun is sure to be one of your memorable moments during your stay. Cancun is incredibly one of the most exciting milieus. Every corner of this Mexican Caribbean nook has something to surprise each member of the family. The naturally rich land coupled by a rich tradition make up for the best destination that is distinctively Caribbean. Here is a list of some other activities you can do in this paradise. A masterpiece as unique as its creator, the recognized Australian golfer and designer Greg Norman, is a bittersweet challenge you will want to take on. Constantly changing views, cenotes, crystal-clear lagoons, mangrove, jungle and the Mexican Caribbean Sea, frame the perfect setting for an experience that can be enjoyed by golfers of all levels. Since 2007, El Camaleón Golf Course, is home to the only official PGA TOUR event held in México, the OHL Classic at Mayakoba. With a total purse of 6.2 million dollars and full FedEx Cup points, the tournament keeps growing in popularity - not only for being one of the most breathtaking venues the PGA TOUR visits each year, but also for being the biggest golf competition in Latin America. Whether you are an avid golfer or a complete beginner, El Camaleón has everything you need. With the only Jim McLean Golf School in Mexico and the first Pure Performance Golf Lab in the country, you can learn and improve your game as much as you want. Also, its restaurant, Koba Casa Club, will give the final touch to an unforgettable day of golf with a delicious concept based on fresh, local and high-quality products. Under the auspices of the renowned PGA champion and golf course designer, Nick Price, the Grand Coral Riviera Maya boasts a magnificent 18-hole golf course where golf pros and amateurs alike can while away pleasant golf days only steps away from the breathtaking Caribbean Sea. Grand Coral Riviera Maya is an excellent example of the way in which golf course designers and developers are working proactively with environmental groups and government agencies, among others, to create golf courses that are planned, constructed and maintained according to a set of standards that fulfill and even surpass local and federal environmental requirements. The vision of golf course designer Nick Price was to create a golf course that naturally adjusted and was sensitive to the beauty of the already existing environment. The design team carried out a planning and routing study in conjunction with a team of carefully selected experts made up of the Grupo Grand Coral Developer, wildlife consultants, biologists, civil engineers and environmental consultants. Carved out of the ancient Mayan Jungle, IBEROSTAR Playa Paraiso Golf Club is one of the latest creations of golf course architect P.B. Dye. The dramatical vertical movement and the distinctive natural rock work are signatures of this unique design, making this par 72 layout a true "one of a kind" in the Mexican Caribbean. Players of all levels will be challenged by the deep bunkers, undulating greens and narrow fairways of this world class 18 hole championship golf course. Featuring conditions only seen at the best golf destinations around the world, Iberostar Playa Paraiso lush paspalum grass covers its 6,800 yards from the tournament tees. Home of the Canadian Tour Riviera Maya Open and PGA TOUR Monday Qualifier for the Mayakoba Golf Classic, Iberostar Playa Paraiso is centrally located 15 minutes north of Playa del Carmen and 20 minutes south of the Cancun International Airport. The green fee includes unlimited food and beverages both on and off the golf course. Includes Transportation back and forth to many nearby resorts. Surrounded by the ecological feat, with carefully crafted water holes, jungles, bunkers and greens, utilizing a rearrangement of the site's native plants, trees and other indigenous foliage, Playa Mujeres has become, an international model in preserving the natural flora and wildlife. You will appreciate the lush, well-kept grass and impeccable true-rolling greens. The white sandy beaches and traps are a visual and playing triumph. Several of the holes offer spectacular views of the Caribbean Sea and Isla Mujeres. 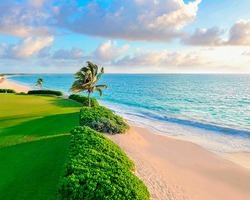 Everything about the course makes it Cancun's most appealing to the truly discriminating golfer. With its masterfully planned design, expert management and unmatched ocean and lagoon holes, Playa Mujeres Golf Club is already recognized as one of the top courses in Mexico. With a high caliber crew, professional golfers for lessons and tips and a pro shop and restaurant and lounge overlooking the 18th hole that is spectacular.